PHOTO: President Donald Trump speaks to members of the media on the South Lawn of the White House in Washington, before boarding Marine One helicopter, April 10, 2019. 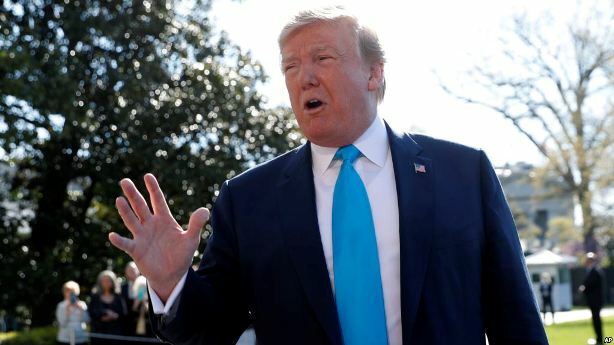 U.S. President Donald Trump contended Wednesday that investigators who started an initial probe into his 2016 campaign were attempting a “coup” and committing “treason” to keep him from winning. 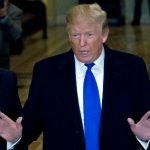 “Everything about it was crooked,” Trump declared, claiming “there is a hunger in this country” for Attorney General William Barr to carry out the investigation he has announced into the origins three years ago of the Justice Department’s investigation into Trump campaign contacts with Russia. The U.S. leader assailed former Justice and Federal Bureau of Investigation officials — he called them “dirty cops” — for their role in starting what eventually led to the 22-month investigation of special counsel Robert Mueller into Trump campaign links with Russia and whether Trump, as president, obstructed justice by trying to thwart the probe. Trump spoke as Barr said that in the coming days he would release a redacted version of the nearly 400-page Mueller report. In his first appearance on Capitol Hill since taking office, and amid intense speculation over his review of special counsel Robert Mueller’s Russia report, Attorney General William Barr appears before a House Appropriations subcommittee. Late last month, Barr released what he said was a summary of Mueller’s findings. He said the special counsel did not find that Trump or anyone in his campaign had worked with Russia to try to tip the outcome of the 2016 presidential election, but that Mueller reached no conclusion about whether Trump had obstructed justice. In the absence of a conclusion on the obstruction issue, Barr said he and Deputy Attorney General Rod Rosenstein decided that no obstruction charges were warranted against Trump. Barr later told lawmakers at a Senate committee hearing that he believes “spying did occur” on Trump’s 2016 campaign, although it was not clear exactly what he was referring to. The U.S. Foreign Intelligence Surveillance Court on several occasions authorized surveillance of Trump foreign affairs aide Carter Page. “I want to make sure government power was not abused,” Barr said. 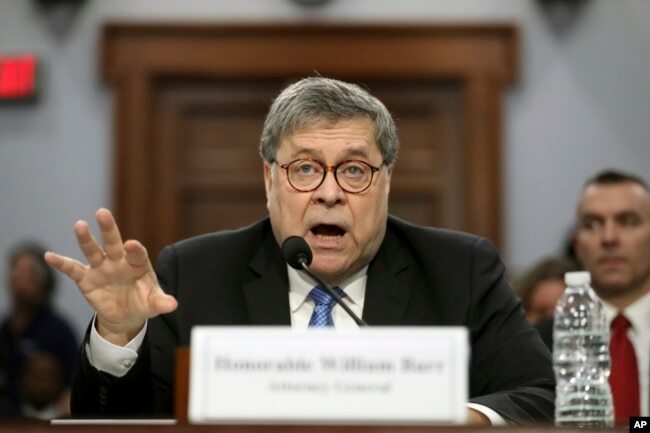 Barr, testifying Wednesday for the second day in a row, was questioned sharply by opposition Democrats about release of the Mueller report and what material he is redacting from the public and the scrutiny of lawmakers. 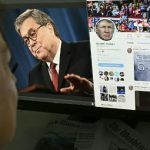 Barr, as he did Tuesday before a House of Representatives committee, said confidential grand jury testimony and information from foreign intelligence sources in the Mueller report are being blacked out. 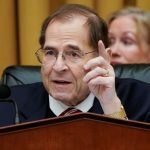 On Tuesday, House Democratic lawmakers criticized Barr, suggesting that in his Mueller report summary he had acted to shield Trump from the full weight of the probe’s conclusions. 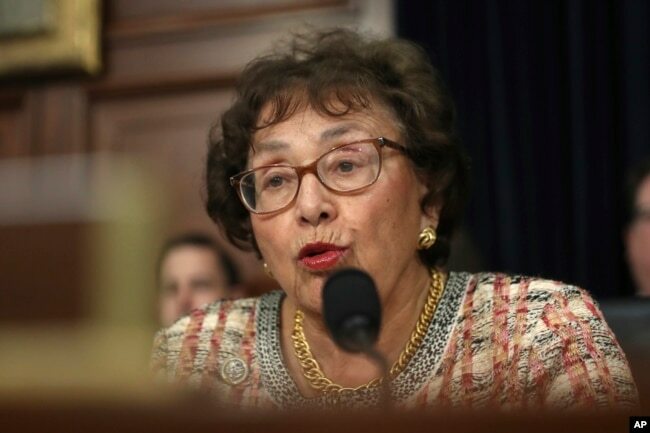 FILE – Rep. Nita Lowey, D-N.Y., Chairwoman of the full committee, speaks before hearing from Attorney General William Barr, as he appears before a House Appropriations subcommittee to make his Justice Department budget request, April 9, 2019. News reports have said that some members of Mueller’s team alleged that Barr’s summary glossed over information damaging to Trump. 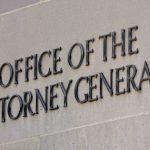 The attorney general did not respond to Lowey’s allegation that he may have “cherry-picked” material from Mueller’s report, nor did he weigh in on Trump’s assertion that the document completely exonerates him of wrongdoing. “I’m not going to discuss it any further until after the report is out,” Barr said. Democrats in both houses of Congress have demanded access to the complete Mueller report, an idea that Barr appeared to dismiss. “I don’t intend, at this stage, to send the full, unredacted report to the [Judiciary] committee,” the attorney general said.